China and India are increasingly consuming global brands and foods in tandem with their rapid development. The two countries are, after all, the largest and fastest growing economies in the world, and account for one-third of the world’s population. Together, they also host two of the world’s most rapidly developing consumer markets. Key drivers shaping this consumer market growth is the increasing GDP and greater consumer spending power in these countries, which in turn facilitate rapidly changing lifestyles, a growing aspirational middle class, and rising interest in health and wellness. This provides a tremendous boost to the F&B industry; presently, China accounts for a US$700 billion market-share in the global F&B market and India provides a US$400 billion F&B market. This article is a brief consumer study to dive deeper into what is fueling the F&B market in China and India, and to offer insights that will help brands strategize more effectively. While their respective F&B markets offer great potential for growth, businesses entering China and India must take into account the differing structural and cultural factors that shape their respective consumer demand. This is key to the success of F&B brands; China and India’s consumer markets are constantly evolving and companies need to be sensitive and responsive to the local environmental, social, and economic factors that impact consumption trends. 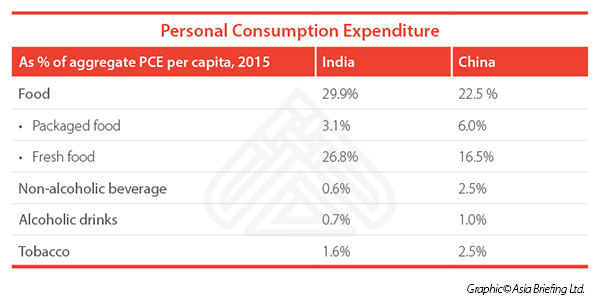 For instance, both China and India have a burgeoning middle class population with rising levels of personal disposable income; yet, the pattern of personal consumption expenditure (PCE) on F&B items greatly varies in the two markets. While Indians spend more on food than China overall, the personal consumption expenditure on packaged food is greater in China than in India. Similarly, the market for both alcoholic and non-alcoholic beverages is bigger in China. Chinese and Indians also show a great variation in their food taste and degree of preference for Western food products. One company that has benefited from and tapped into this consumer insight in China is Brolos. The company utilized its Australian heritage to bring its lobster brand to life in the Chinese marketplace. On the other hand, in India, consumer food preferences are strongly influenced by religious requirements, such as halal and vegetarianism or region-specific factors; that is, consumption preferences vary from one state to another. Foreign brands in India, therefore, need to customize their products based on local ingredients and cuisine specialties to cater to the diverse food preferences. For example, the American heritage brands Kentucky Fried Chicken and McDonald’s have managed to retain a strong hold in the Indian market by offering a menu that is suited to the tastes and predilections of every Indian customer. Connected consumers are increasingly aware of food scandals as well as the benefits of healthy eating. However, the drivers and motivation for healthy eating differ in China and India. In China, thanks to traditional Chinese medicine’s influence, health is the foundation for all that they do, whilst in India, health is more aspirational. This difference means that brands need to have two distinct strategies for the two markets around what drives consumers to be healthy. To illustrate, the two countries portray unique preferences in terms of their “Liquid Delivery Needs”. For China, we identified a focus on key words such as nutrition, balance, and ‘feeding the body’, which translate to a desire for more premium waters, RTD teas, probiotics, and fruit juices. For Indian consumers, it was more about rejuvenation, refreshment, and ‘coming alive’; materialized in a desire for more herbal, ‘citrusy’, and berry flavoured carbonated drinks. Both countries’ food safety and regulation also inform consumption habits and preferences, having undergone rapid development in the last few years. With the increasing Chinese appetite for imported food products and food safety scandals on the rise, China has introduced series of amendments under its 2015 National Food and Safety Law. These amendments give broader regulatory powers to authorities, and seek to introduce special measures concerning health foods, medical foods, baby foods, and GMO foods, bringing them within the remit of the Food Safety Law. To avoid fines, forfeiture of benefits, revocation of license and other severe penalties, companies exporting F&B products to China must ensure that their food products comply with the national food standards. For example, food products entering China must display an ingredient list that marks clear differentiation between raw material and food additives. Importers should check the list of approved food materials by the Chinese government, and verify whether the component ingredients are classified as a food or as a drug. Thus, companies should keep up to date with all food related notices released by China’s National Health and Family Planning Commission. In India, the food regulations are more complicated and ambiguous. The central food regulating agency, the Food Safety and Standards Authority of India (FSSAI), categorizes foods into two types, standardized and non-standardized. The former types of food do not need approval before manufacture, import or sale, whereas non-standardized food types are not uniform or completely formulated. Further, food items imported and distributed in India need to conform to the FSSAI regulations for packaging and labeling. These regulations require product labels to specify ingredients as well as additives, in order of their composition by weight and volume, which for alcoholic beverages is not always possible. Another requirement for food products is to have ‘inseparable labels’ and not detachable stickers. While both China and India offer vast opportunities in the F&B industry, brands entering their respective markets need to be conscious of potential challenges. The most important of these relate to the complicated regulatory framework and stringent food laws in these countries, and their infrastructure and pricing strategies employed by domestic players. To be successful in these markets, F&B companies need to be sensitive to sociocultural and other factors shaping consumption trends. This is where direct market research becomes important as engaging with consumers on the ground offers crucial insights that enable companies to create or customize products that can satisfy consumers’ rapidly evolving needs and preferences, and also stay price effective. Dezan Shira is a full service practice in China, providing business intelligence, due diligence, legal, tax, IT, HR, payroll, and advisory services throughout the China and Asian region. For assistance with China business issues or investments into China, please contact them at china@dezshira.com or visit www.dezshira.com. The Silk Initiative is a business strategy and marketing mix innovation consultancy specializing in the food and beverage space. They provide a range of brand strategy, consumer insight, business intelligence and creative execution strategies to clients ranging from global food and beverage giants to SMEs. Need help making sense of the complexities of the China and Asia market? Contact them at info@thesilkinitiative.com or visit www.thesilkinitiative.com.